Cadmium (Cd) is a heavy metal of high interest to the Superfund Initiative. It has no known physiological function but is a neurotoxicant. Cd exposure is associated with cognitive and olfactory impairment. However, little is known concerning the underlying molecular and cellular mechanisms. This project explores the molecular and cellular basis for the deleterious effects of Cd on cognition in mouse models, with a focus on its effects on adult neurogenesis and Ca2+ signaling critical for hippocampus-dependent memory. The researchers hypothesize that Cd interferes with adult neurogenesis in the hippocampus, and disrupts Ca2+ signaling in neurons critical for learning and memory. They further hypothesize that these adverse cellular and molecular effects may underlie Cd neurotoxicity in cognition. Researchers are determining if Cd2+ inhibits hippocampal adult neurogenesis and hippocampus-dependent memory formation. They are also investigating the effect of Cd2+ on Ca2+ signaling in hippocampal neurons in vivo. Researchers are utilizing both primary cultured neural stem cells and in vivo mouse models. Studies are providing new insights concerning mechanisms of Cd neurotoxicity. Results may establish new mouse models to investigate Cd neurotoxicity and may shed lights regarding neurotoxicity of other heavy metals. 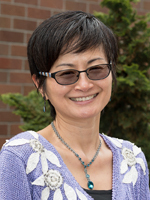 Principal Investigator: Zhengui Xia, Ph.D.
Mechanisms that regulate neurogenesis including neuronal fate determination, neuronal survival and differentiation both during brain development and in adult brain.